Flavonoids (apigenin), maltol, cyanogenic glycosides (gynocardin), indole alkaloids including harmine, harmaline and harman. Steroidal substances and saponins. 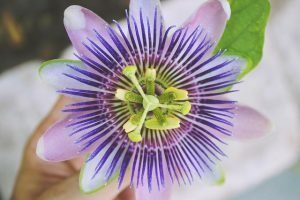 Tranquilising – the tranquilising properties of Passionflower have been well researched however its mode of action on the central nervous system is still poorly understood. The aerial parts do have established sedative, tranquilising an sleep inducing properties, but the constituents that cause these actions have not yet been identified. Should only be used under practitioner supervision. Harmless in low curative doses however, an excessive dose may cause adverse effects such as headache and temporary visual disturbances.